Custom built closets and installation by Highlands Decorating Center is offered in the following areas of Western North Carolina including: Highlands, Cashiers, Franklin, Sylva, and Lake Toxaway and we are equipped to service Clayton, Georgia and nearby areas such as Lake Rabun, and Lake Burton. Highlands Decorating can create luxurious, wood-designed and custom built closets using your wishlist and space dimensions. If you dream it, we will create it. Imagine floor to ceiling space to showcase your best accessories and wardrobe items. We’ll create custom built closets exclusively for you. We utilize the best materials and products when creating custom built closets including thick beautiful woods in a diverse array of finishes that you can choose from, gorgeous lighting and chandeliers, gorgeous custom doors, lock boxes for your valuable accessories like jewelry, and unique hardware that you are able to select and choose. 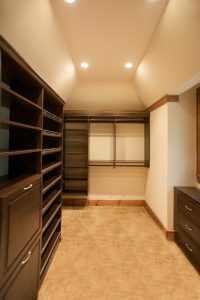 Custom built closets built by Highlands Decorating also can include beautiful custom created closet islands as well made from beautiful hardwoods, marble and granite. If you are searching for custom closet solutions and design in the areas of Western North Carolina and North Georgia, give us a call or fill out our form below. We’d love to give you a quote after we get measurements and a wishlist of items from you. We invite you to visit our Rubbermaid Closet Organizers page..